One of the first things you need to do after you’ve decided to complete a Whole30 is to clean out your pantry. I mean, really clean it out. The easiest way to fall off the wagon is to have tempting non-Whole30 foods in your pantry, refrigerator, or cabinets so that when the day hits where you don’t want anything good to eat and you’re cranky, tired – and did I mention cranky? – is to spy the half-empty box of cheez-its hiding in the back shelf or that frozen chocolate bar you hid in the freezer “just in case”. If you want to succeed with 30 days of extremely clean eating, you need to get rid of all those temptations. 1. In the weeks leading up to your Whole30 start date, you can binge on all the non-approved foods in your pantry. I don’t really recommend this approach – it’s going to make your Hangover phase that much worse. The cleaner you eat, the better your body feels and the less time it takes to adjust to eating good, whole, healthy foods. By gorging yourself on processed foods and sugar snacks you are overloading your body with toxic chemicals that will take longer for your system to expel. Regardless of how clean you eat prior to starting the Whole30, it can still be a shock to the system. Not only that, but when you eat a lot of junk your body feels more like junk. So again, while this is technically one way to clean out your pantry…I strongly suggest a different option. 2. Throw out all the non-approved foods from your pantry. This is another option; but depending on the amount of food you’re looking to purge, this can be a pretty expensive option. Also, there are some foods you may start eating again after the conclusion of the Whole30 – like honey, or maybe rice, canned green beans, or the jar of pizza sauce you didn’t realize had sugar in it. I’m not suggesting you get rid of these things forever – the Whole30 is meant to be a reset, not a forever lifestyle. 3. Donate your non-approved foods to a neighbor or local food bank. – This is a great option, particularly for the foods you probably shouldn’t eat even after the Whole30 concludes. Obviously this one doesn’t work for the opened items, so feel free to toss those. 4. Box up the non-perishable, non-approved foods and store them somewhere else – This is a great plan for those items you plan to re-incorporate into your diet once the Whole30 concludes, and this is what I typically do with items such as rice, canned beans, popcorn kernels, and all the condiments or spices that include sugars or other non-approved ingredients. As long as you have the storage space and the will power to not go digging into the box somewhere around day 20, this is a good way to go. For those of you who are concerned about your will power, try asking a neighbor or a family member to store your box for you until the 30 days are up. So, what do I recommend? Surprisingly, a mix of all four options, as I share below. There are some non-approved items that Kevin and I are happy to consume prior to the Whole30, but there are just as many (if not more) things that I’m content to toss. 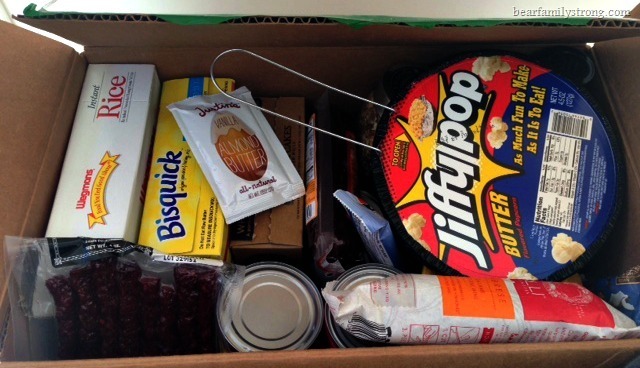 And although we don’t normally have items that require donation, only since we’ve maintained a relatively clean eating lifestyle for years, we frequently pack up a box that gets re-opened in 30 days. Now that you’ve gotten rid of all the things you won’t be eating for the next 30 days, let’s hit the grocery store and stock up on what you will be eating! Posted on 3 February 2016 30 January 2016 by BeePosted in Whole 30Tagged pantry clean-out, Whole 30, whole 30 prep. 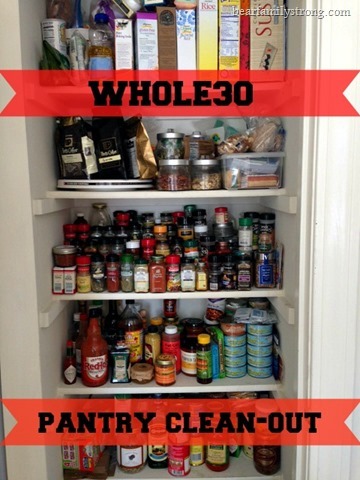 Next Next post: Whole30 Prep – Stock up and Shop! I’m starting the Whole30 at the end of the month!! Awesome! I’ll be posting lots of approved recipes if you need ideas! Good luck and let me know how it goes!